When it came time for the Central Pacific – Southern Pacific moguls to promote a town site where the Northern Railway would cross Stone Corral Road about 10 miles north of Williams, they apparently decided the pie should be cut four ways. Sale of lots in this new town was turned over to the Western Development Company. However, before this company was ready to start laying the town site that became Maxwell, it had to contend with W. S. McCoy, who for several years, had been constable for the area and owned land north of Stone Corral Road west of the Northern Railway survey. McCoy had County Surveyor Jim Doyle prepare a map for a town called Occident. This town play, which was drawn freehand, contained four blocks located north of Stone Corral Road immediately west of the railroad survey line. Stone Corral Road was renamed Oak Street. Adjacent to the railroad tracks on the east side of the town was Sacramento Street. The western boundary of Occident was California Street and the northern boundary was Vine Street. The town play was not recorded in the courthouse at Colusa until November 20, 1877; however, it had been prepared much earlier. Unfortunately, the map does not contain the date on which it was drawn. There is nothing to indicate a town at this location on the county map that was prepared to J.B. DeJarnatt and adopted by the Colusa County Board of Supervisors in 1874, as the Official Map of Colusa County (original map is in the Hall of Records). First mention of Occident in the Weekly Colusa Sun newspaper in the issue of March 17, 1877, which reported that “a new town had been laid out on the survey of the Northern Railroad about 10 miles north of Williams called Occident.” This issue also related that Spaulding, Lowery and Company was about to open a general store at Occident and that George Maxwell also had a saloon there. Two weeks earlier, the Weekly Sun’s newspaper correspondent at Williams had mentioned that the Winters firm Spaulding, Lowery & Company was erecting a store “at a place styled Stone Corral.” The location was probably taken from the name of the road which the store building faced. In mid – April, Editor Will S. Green visited Occident and wrote that, besides the store, school and a saloon, “two or three very nice residences make all there is of the town at present.” Later, the residences were identified as being the homes of W.S. McCoy, Owen Daley and W.R. Spaulding. A post office was established at Occident on April 5, 1877 and it was announced that John McCoy had been appointed postmaster. Later it was reported this was a mistake. McCoy was principle circulator of the petition for a post office, but had recommended that George Maxwell be named postmaster. Maxwell finally got the job. 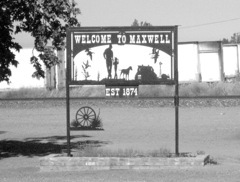 The weekly Colusa Sun Newspaper indicates that the post office was called Maxwell from its inception. The naming of the post office for George Maxwell indicates that he had already agreed to give the Big Four the site for the Northern Railway Depot at Stone Corral Road. It was the Big Four’s practice to name the town for the person who gave them the site for the railroad station. Nevertheless, news articles in the Weekly Colusa Sun Newspaper continued to refer to the new town as Occident until September 1878. Then, on September 14, 1878, the Weekly Colusa Sun Newspaper reported that “the Railroad Company had decided to call the town formerly known as Occident, Maxwell, and as the name of the post office is already Maxwell, it will certainly have to be called by that name,” George Maxwell’s pioneer saloon, which was in existence from the beginning of the town, was located at what is today the southwest corner of Oak Street and Old Highway 99W. George Maxwell had a building erected to be used as a livery stable next to his saloon in October, 1879, but the founder of Maxwell was not destined to profit from this new venture. He died in his town on November 28, 1879 at the age of 51 years. He is buried in Colusa Community Cemetery as there was no cemetery in Maxwell at that time. Just as today, all these business men depended on the farmers in the outlying districts and the farmer depended on the businesses. Maxwell is in the center of Colusa County and in the middle of the Central Valley Irrigation District.